Beyond providing data for all 32 NFL teams, PFF also supports network broadcasters with game-preview packets that are used to enhance the in-game experience for fans and viewers. This Ravens-Titans preview features the same information our broadcast partners use for team research and in-game production. 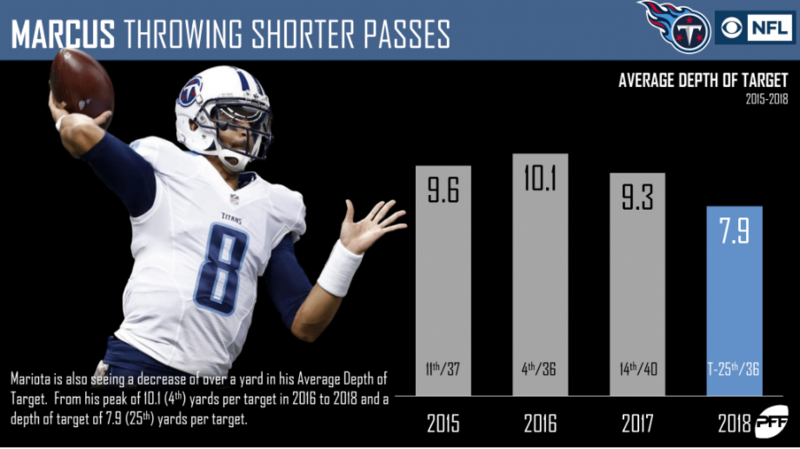 Through five weeks, quarterback Marcus Mariota has seen a sharp decrease in his average depth of target. The fourth-year quarterback’s average depth of target currently sits at 7.9 yards downfield, which ranks 25th among 36 qualifying signal-callers. 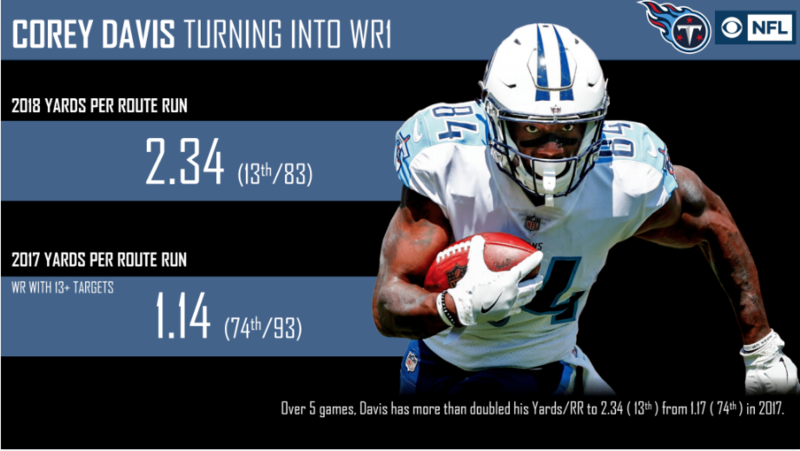 Receiver Corey Davis is quickly morphing into the player the Titans thought he would be a year ago. Davis increased his season grade from 63.1 to 79.4 as well as doubled his yards per route run. The second-year player is having quite the 2018 campaign, but he will face a tough test this week when he matches up with the third highest-graded cover unit (84.4) in the NFL. 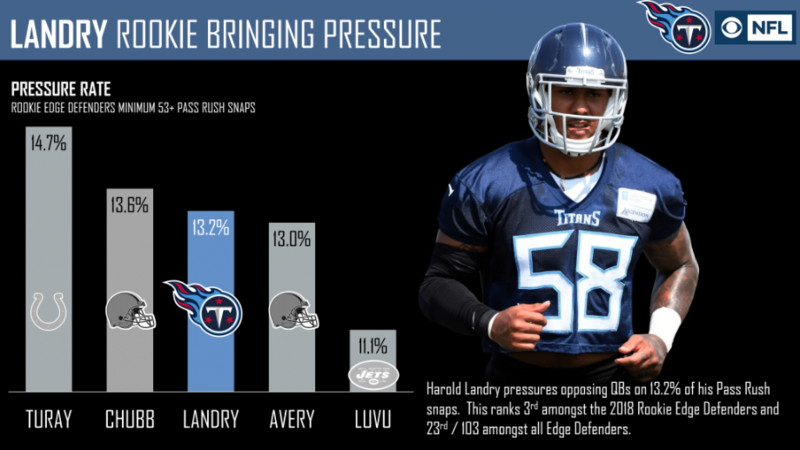 Rookie edge defender Harold Landry has helped accelerate a Tennessee pass-rush unit that graded as the 20th-best unit in the NFL (69.4) a season ago. Landry has pressured opposing quarterbacks on 13.2% of his pass-rush snaps, which is the third-highest rate among rookie edge defenders. 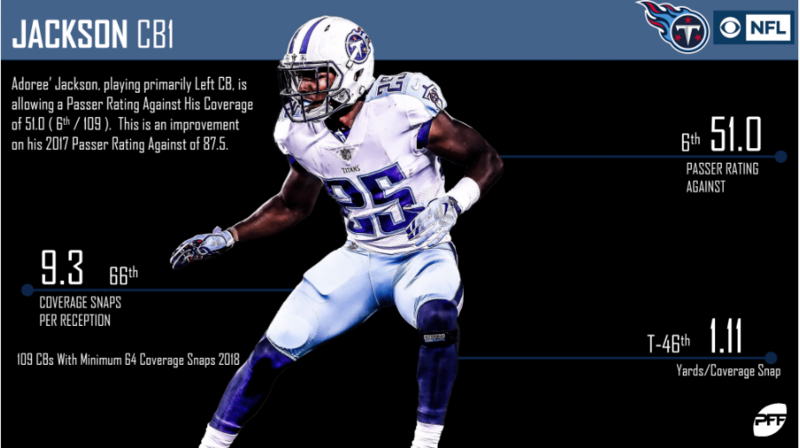 Following on from a strong rookie campaign, second-year cornerback Adoree’ Jackson is allowing a passer rating of just 51.0 on throws into his primary coverage this year – the sixth-best mark among cornerbacks this year. 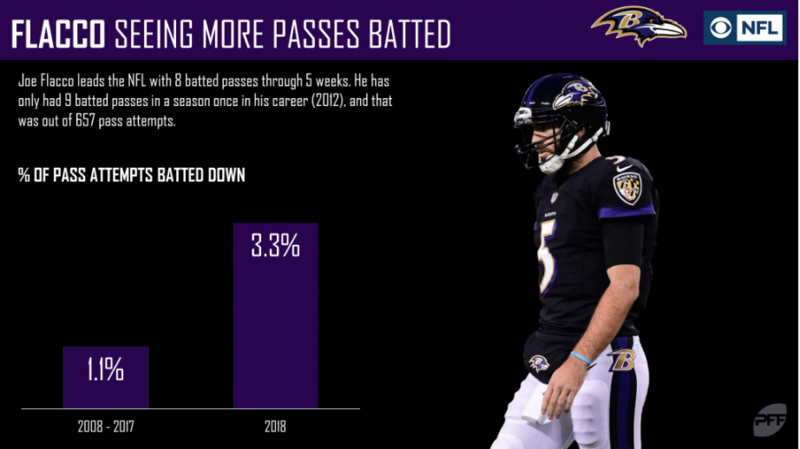 Ravens’ quarterback Joe Flacco has had a league-high eight passes batted down at the line of scrimmage so far this season. The Titans will look to add to that on Sunday. 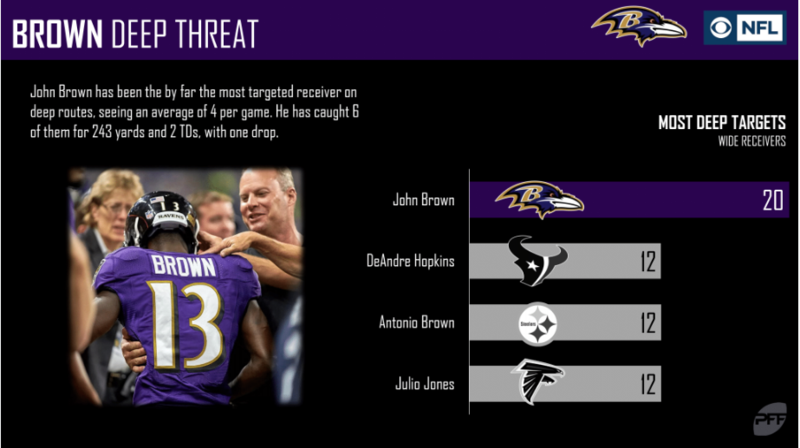 Ravens’ wide receiver John Brown is adding a whole new element to the Baltimore offense. A season ago, the Ravens most prominent deep threat was Mike Wallace who had 21 deep pass targets. This season, John Brown has eclipsed 20 in just five weeks. 50% of Brown’s targets are on passes 20-plus yards downfield. Ravens’ safety Eric Weddle, the 23rd highest-graded safety in the NFL (74.0), has been nearly lock-down in coverage this season, only surrendering four receptions on 197 coverage snaps. 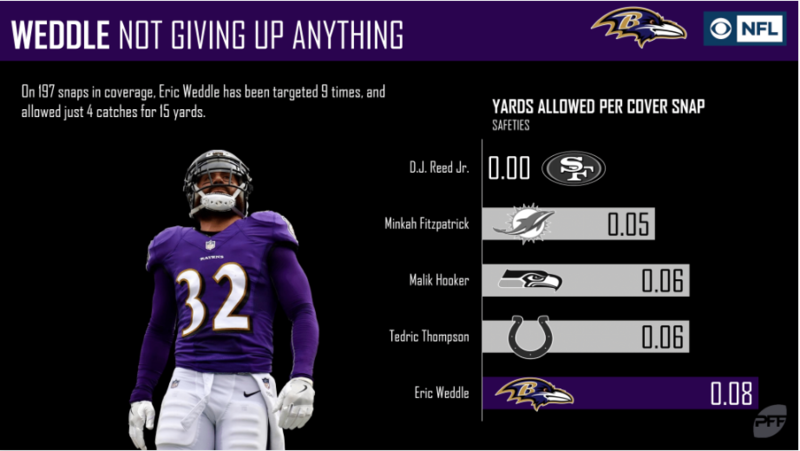 Weddle is rarely targeted but has yet to give up a touchdown in coverage this season. 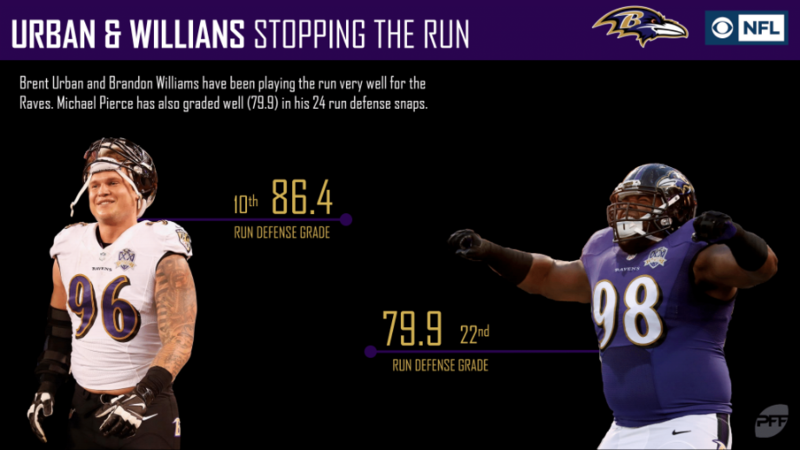 Brent Urban and Brandon Williams have been bright spots for the Ravens defense this year. The duo has racked up ten combined run-stops with zero missed tackles. The group will have their hands full in Week 6 against Dion Lewis and Derrick Henry of the Titans, who have avoided 19 and 14 tackles this year, respectively. 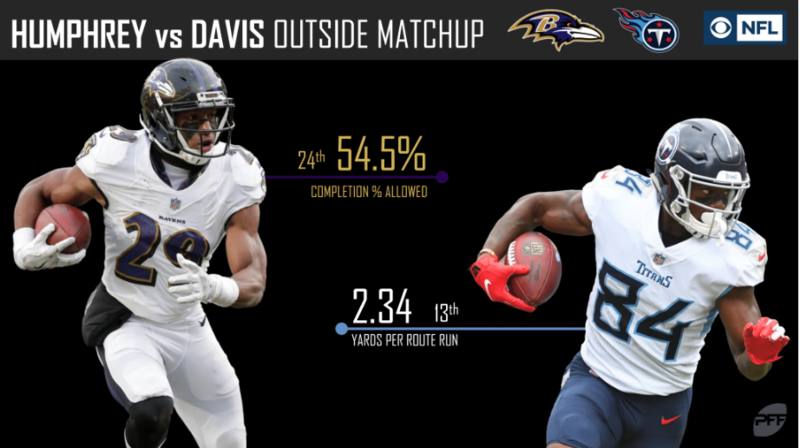 PFF Greenline has projections for the spread, moneyline and over/under of the Ravens’ matchup with the Titans. Get its picks here.